Summer Time…Summer Time….Fun, Fun, Summer Time! Summer, the season of fun, water, sun and sand…Long sunny days and warm nights…..enjoy it all and stay safe this summer with these safety tips. Protect your skin with sunscreen/sunblock. Apply sunscreen/sunblock 30 minutes before sun exposure to allow the ingredients to fully bind to the skin. Reapply sunscreen every two hours, as is just as important as putting it on in the first place. Wear bathing suits with ultraviolet (UV) protection built in them. Ultraviolet protection factor (UPF) rating system measures the UV protection of a piece of clothing. Clothing with a UPF rating of 50 only allows 1/50th of the UV radiation falling on the surface of the garment to pass through to your skin. Find a bit of natural shade or use umbrellas to cool off under. Prevent dehydration by drinking plenty of water and hydrating fluids, avoid dehydrating liquids like coffee and alcohol. Prevent overheating by using fans and air conditioners. Wear light weight and light colored clothing. Be aware of the signs of heat stroke, heat exhaustion and sun poisoning which include fatigue, headache, confusion, muscle cramps or weakness, nausea, pale skin, rapid heartbeat, and dizziness. Use the “Buddy System”. Never swim alone! Swim where and when there is a lifeguard present. Stay within the marked boundaries of the lakes, ponds, and swimming holes. Always be aware of underwater dangers, such as down tree limbs, rocks, and anything else that can cut feet or snag onto arms or legs. Wear Coast Guard approved life jackets on boats, canoes, kayaks, jet-skis and any other watercrafts. Let people know where you are headed and when you are expected to return. Have a flashlight, phone, whistle and emergency kit with you. Never attempt to use a watercraft that you are not familiar with. Wait until you have received proper training from someone familiar with the watercraft. Wear shoes when walking in the sand, as the hot sand can burn and even blister your feet. Be aware of the dangers of digging large holes and tunnels in the sand. Sand holes can collapse, trapping people and making rescue efforts very difficult. Do not dig a hole in beach sand deeper than your knees when you are standing in the hole. Never bury yourself or anyone else “up to your neck” or entirely in beach sand. Deaths have occurred when sand holes and tunnels collapsed preventing the victims from breathing. Always fill in the hole before leaving the area so others do not fall into the hole and injure themselves..
Summer is a wonderful time of year to spend outdoors. 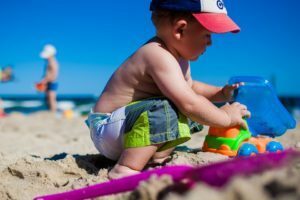 Use these tips to keep safe while you enjoy your favorite activities in the sun, sand and refreshing water.